★Sturdy Construction - Made from top-end durable 700D Polyester and Polypropylene(PP) material to avoid any breaks or deformation. There is a line of bonding joint each septum to the side of the file folder, we make the bonding by one-time hot pressing production line, which means it will not be split easily like most of other file folders, and affords to a very long time use. ★3000 Sheets Large Compacity - The large capacity A4 size file folder(size: 12.59" X 9.25", width: 1.96"-20.47") is suitable for daily filing and storing of documents, fitting both A4 Size and Letter Size. It can hold approximately 3000 sheets so you'll not be obsessed by your cluttered files any more. ★Multiple Function - You can keep your documents, vouchers, paper, recipes, cards, receipt, painting work and coupons with it. The expanding file folder is a perfect document organizer for home, office, school and travel, simple and fashionable. ★Multi-use & Time Saving - The pockets are tabbed to allow for adding handwritten labels, ensuring each section can be instantly identified for quick access. Keeping your holiday documents, vouchers, cards and coupons etc tidy and organised，better organize and classify your files easily with a stylish appearance. 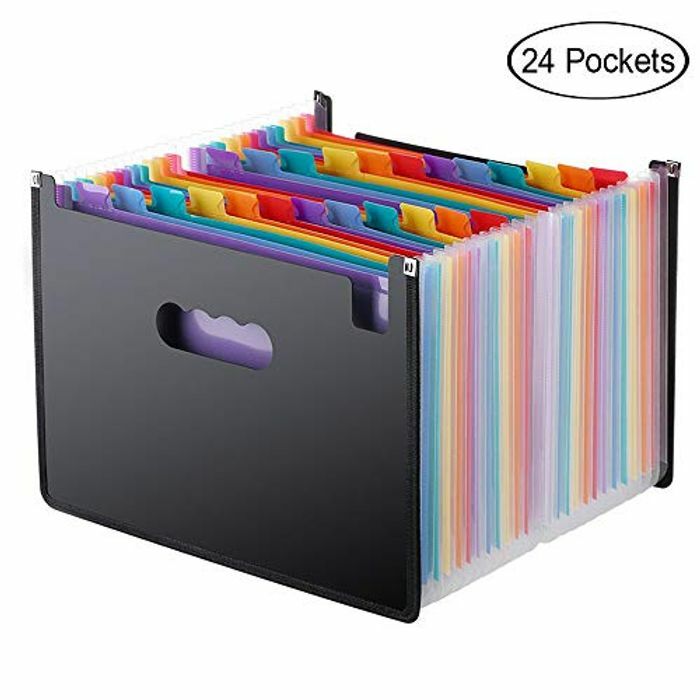 ☆Expanding file folders for organizing and storing important papers or documents. ☆Super-durable poly material provides waterproof and tear-resistant performance. ☆Acid free, PVC free, and archival quality for added peace of mind and safe storage. ☆Holds up to 3000 sheets; 24 individual pockets, each expanding to 27 inches and tabbed for labels. ☆Two handle and deep pocket provide added security and safe transport.